Chop up red peppers and green onions to make a tasty Bacon Omelet Roll with Salsa. 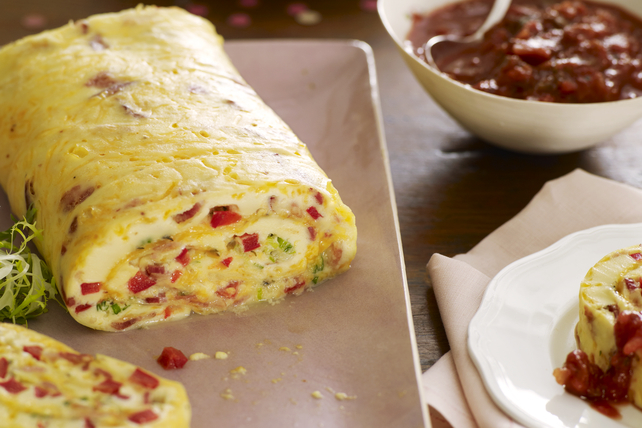 This omelet roll with salsa is definitely a party waiting to happen! Beat eggs, milk and flour in large bowl with whisk until blended. Stir in next 4 ingredients. Pour into prepared pan. Bake 14 to 16 min. or until edges are almost set. Top with cheese; bake 2 min. or until melted. Substitute 6 finely chopped slices OSCAR MAYER Baked Cooked Ham for the crumbled cooked bacon. When using eggs, break them, one at a time, into a small bowl before mixing with the other ingredients. This allows you to check the egg's quality first and remove any pieces of shell, if necessary.